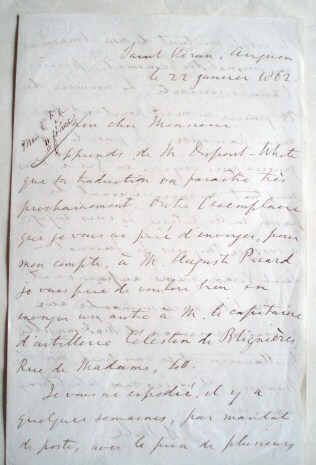 Autograph letter signed to Gilbert Urbain Guillaumin. Large octavo, 20.5 x 13.0 cm, 3 pages in French in ink. Gilbert Urbain Guillaumin (1801-1864) was co-founder of the Journal des Economistes in 1842 and was publisher of the French translation from the third edition of Mill’s Principles of Political Economy and Representative Government and Charles Dupont-White (1807-1878) was the French economist who translated Mill’s Representative Government. In this fine letter Mill asks Guillaumin to send copies, now approaching publication, of his Le gouvernement représentif to his Avignon friend and writer on economic and agricultural subjects Auguste Picard and the positive philosopher Célestin de Blignières (1822-1905). Mill reports that he leaves for Greece on January 29th, and to forward to Poste Restant Athens anticipated articles on his book by Emile Littré (1801-1881) and on books of Dupont-White in the Journal des Débats.